Tracing the origins of audio power amplifiers to the state of technology today. The state of power amplifier technology has never been better, and that’s only going to improve from here on out. But how did we get here? What are the key milestones and technological developments along the way that has taken led to such lofty heights? Author Frederick J. Ampel has been involved in the pro A/V industry for more than 40 years. His career has included work in live sound reinforcement, broadcast audio production, systems design and installation, systems integration, hardware design and development, and residential small room acoustics. 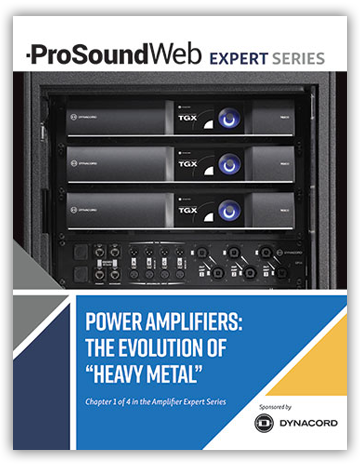 The ProSoundWeb Expert Series on Power Amplifiers is presented by Dynacord and features top authors from ProSoundWeb and Live Sound International magazine. All future chapters will also be available for free download on PSW.